Bionx election assist systems will electrify most models of recumbent trike or bike with an elegant interface between your power and the motor power. “Bionx” is one of those made-up words. You’d pronounce it like “bionics,” that is “Bi-YON-iks,” if you are an English speaker, or “Bee-yo-NEEKS” if you are a French speaker, or “Bee-YONKS” if you are too clever by half. 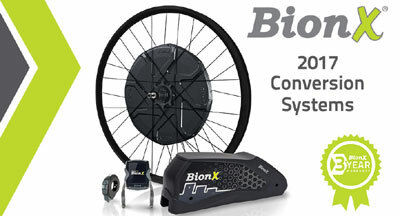 All Bionx kits consist of a motorized rear wheel, a battery and mount, battery charger, and controls. A Bionx assist kit will retrofit to any bike or trike that has a single rear wheel. Among our bikes that rules out delta trikes like the Sun EZ-3, but it is fine with all tadpole trikes and two-wheelers. It fits into standard 135mm wide frames, which is standard rear hub width on mountain bikes, hybrid bikes, cross bikes, and the vast majority of recumbents. Road bikes, track bikes, BMX or bikes designed for internally geared hubs have have more narrow dropout spacing and it will be difficult if not impossible to wrestle it in. Bionx has a motor kit for “Fat bikes”, which use wider rear hubs. The motor is the rear wheel hub, and we will install your 7, 8, 9 or 10 speed cogset on for shifting with a rear derailer. Rear wheel mounting is a good thing because bicycle frames expect torque at the rear wheel. Front wheel fork dropouts are not designed to resist the forces motor wheels put on them, and we’ve seen forks damaged or destroyed by front wheel motors. Indeed, we’ve seen frames damaged by people putting too-powerful motors on their bikes. If you are using an internally geared hub on your rear wheel you will have to replace that whole system. Bionx kits are not cheap. We resisted stocking them for this reason, but we’ve learned better. These are the most reliable systems we’ve worked with. We can still see problems or need support, but their support and diagnostic tools are excellent. Systems carry a three year warranty and all the parts are sturdy with a finished appearance. We’ve worked with cheaper systems and we’d rather not get involved with them any more. You have two real choices when choosing a system, motor type and battery size. You can choose the wheel size too, but your trike’s wheel size will choose that for you. The choice with the greatest effect on price is the size and shape of your battery. Batteries come in two configurations. The “downtube” or D-type battery mounts on your bike frame. On trikes we often use a battery mount made by TerraCycle, but some manufacturers offer their own battery mounts. Adding a battery mount will affect your price. How you mount your battery is an important question. Fitting the rack type battery is straightforward so long as you have fittings on your bike frame to mount a rack. A downtube battery can be fitted to the water bottle cage mount on the boom of the trike, but this can make getting on and off the trike more awkward. The “rack” or R-type battery comes with a special rear carrier rack that houses the battery, with an integrated taillight, and can also carry panniers or a rack top basket. I don’t like using the rack type battery on tadpole trikes since putting mass directly above the rear wheel destabilizes the trike, but it works fine on 2-wheelers and is my preferred way of doing it on recumbent bikes, in most cases. Batteries come in three different sizes. Battery size is the biggest influence on price and this directly affects your range. For reasons both historical and silly, battery sizes are L (smallest), X, and V (largest). Go figure. The V size battery only comes in D-type. For trikes we recommend D-type batteries since putting mass on top of the rear wheel can destabilize the trike. Anyone getting an electric assist is concerned about range, and that is a tricky thing to estimate since there are so many variable in hills, stops, and simply how the user runs their battery. Aerodynamics and wind will also affect this. Bionx quotes ideal ranges of 50 miles (L size battery), 65 miles (X battery) and 80 miles (V battery). We’ll be pessimistic and say you’ll be able to do about half of that or more, depending on your condition. Having used a variety of electric vehicles over the years and I can also assure you that your range will decrease as the battery ages. Here is a tip: a battery is like a living thing and it likes to be fed. Charge your battery at every opportunity and never let it sit around hungry. With D and R battery shapes and L, X and V sizes, we refer to batteries as DL, RL, DV, and so on. The other choice is between the 350-watt P350 motor or the 500-watt D500 motor. The D500 motor is larger and will only go into 26″ wheels and larger. It is Bionx’s latest design. The P350 can fit down to a 349mm 16″ wheel. Bionx pioneered a new method of throttle control on e-bikes, one that is really “bionic.” You pedal the trike, it senses how much power you put in, and it follows you, giving a proportional amount of power. You don’t twiddle additional controls, just set the assist level and ride off. It is just like riding your trike, only you are 1.5x to 4x times as strong (depending on assist mode). It doesn’t add to your power, it multiplies your power. If you try to do this with too powerful a motor it doesn’t work. The motor kicks in and the bike leaps forward. Your resistance at the pedals drops so your power input drops and the motor shuts off. Jerk, jerk, jerk. This doesn’t have the seamless, cybernetic feel of Bionx. The lowest priced Bionx system is the P350DL at $1799. Going to the rack type battery adds $100, so a P350RL is $1899. Stepping up to the X size battery adds $300, so a P350DX is $2099 and the P350RX is $2199. Upgrading to a V battery is $200 more, so a P350DV is $2299 (V battery is not available in the rack configuration). D-series motor kits only come with V sized batteries, and the D motor upgrade adds $200, so a D500DV is $2499. Wait, but the dollar signs don’t end there. Other charges will probably apply. Installation is $95 and you’ll appreciate that as money well spent. Trikes and underseat steering bikes usually need extra hardware to mount all the controls. Extension cables are sometimes necessary on some recumbent frames. Like most bike stuff, Bionx designed their kits around upright bikes. Specialists like us get them working on recumbents. How you mount your battery can affect price. If the battery is mounted near the front, like on the boom of a trike, then you will need an extension cable for the motor. If it is closer to the motor and you have long, high handlebars then you’ll need an extension cable for the controls. Mounting the battery behind the seat is best, but battery mounts add about $130-150. Depending on your trike, we may need to order in the battery mount. This can take up to a couple of weeks at worst.